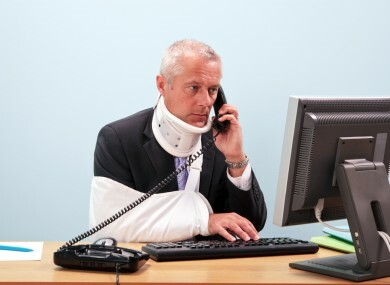 Are JobBridge interns insured if they have an accident in the workplace? Concerns have been raised about whether interns are being covered by their employers. CONCERNS HAVE BEEN raised about whether thousands of interns taking part in the controversial JobBridge scheme are being covered by employers’ liability insurance. The Department of Social Protection insists on employers extending their insurance policies to cover any JobBridge intern they take on in case they have an accident in the workplace. Sinn Féin believes this is essentially an ‘honour system’ with no way of verifying if policies are actually being extended to cover interns. JobBridge offers unemployed people an extra €50 on top of their social welfare payment if they participate in a six-month internship. The scheme has been the subject of much criticism despite a report last year finding that three in five participants secured employment within five months of completing their internships. Sinn Féin’s social protection spokesperson Aengus Ó Snodaigh recently wrote to the junior social protection minister Kevin Humphreys to outline his concerns. He said: “I remain concerned that there may be interns out there who are not covered by the Host’s Employers Liability Insurance especially given that in the main such insurance is limited to persons listed as employees. The Department of Social Protection said that while it has received enquiries from interns and employers on the issue it has no records of any complaints about employers not covering interns. In his response to Ó Snodaigh, Humphreys, a Labour TD, said: “All host organisations who have submitted an application for a JobBridge internship are subject to these conditions. In a statement to TheJournal.ie, the Department said that any failure to honour the terms and conditions of the scheme will be acted upon and could include participating employers being banned from using JobBridge. “While the Department of Social Protection has received enquiries from interns and Host Organisations on this particular issue, it has no record of receiving any complaints. Ó Snodaigh said that his party is concerned that some of the 6,500 people taking part in JobBridge are not insured to work for their employers. “If the intern is involved in or causes an accident while conducting their duties, and is not on the premises covered by the sponsors Public Liability Insurance then they would not be covered by the companies Public Liability Insurance,” he added. The Dublin South-Central TD said that interns could be exposed to “huge financial ramifications” if they are involved in an accident. He reiterated his party’s long-standing call for the JobBridge scheme to be scrapped. “If the government refuse to do that then the least it can do is proactively ensure that all interns are protected by insurance,” he added. Read: Did Gerry Adams want JobBridge expanded, not scrapped, just a few months ago? Email “Are JobBridge interns insured if they have an accident in the workplace? ”. Feedback on “Are JobBridge interns insured if they have an accident in the workplace? ”.